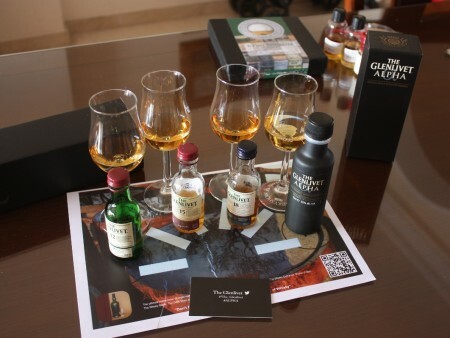 Yesterday, we had another great tweet tasting with The Glenlivet and Steve from The Whisky Wire. To be honest I were not going to apply to this tasting because I had already tasted the Glenlivet 12, 15 and 18 ( oops, looks like I didn’t taste it ) and although Alpha was somewhat appealing I though I was just a marketing move. So there I was with great whisky people and @The_Glenlivet to taste four Glenlivet whiskies: 12, 15, 18 years old and their latest addition Alpha. There were so many people on the tweet tasting that it was really hard to drink, write and keep updated on the tasting. It was a fantastic chance to revisit the good old Glenlivet 12 years old. I remember tasting it a few years ago and I wasn’t very impressed with it but on the other hand the 15 years old was much better ( different others say ). Also it has a lovely touch of sherry on the palate, not much, just the tinyest hint of it. One of the most famous malts in the world. A soft smooth balance of sweet summer fruits and the floral notes of spring flowers. Nose (88): more than average. honey, vanilla, citrus, spices, ripe pears. Palate (86): light, smooth. honey, malt, vanilla, spices, candies, tobacco, wood. Finish (87): longer than average. honey, wood, vanilla. So based on other whiskies I have already tasted I rate this Glenlivet 12 year with 87 points over 100. Woo! Things are getting serious. I though I have tasted this 18 years old before but looks like it is my first time…, so familiar anyway. All the three drams so far has Glenlivet footprint on them. Palate (90): powerful, oily. honey, wood, citrus, vanilla, spices, nuts. So based on other whiskies I have already tasted I rate this The Glenlivet 18 Year Old with 90 points over 100. Without being something awesome this 18 years old is pretty impressive with a great nose for a 18 years old whisky with lots of spices and toffee. And finally, after so much expectation here it is Alpha. The premise with Alpha is that Glenlivet launched a single malt whisky bottled at 50% ABV and without any more information: nor color, nor tasting notes, nothing. This whisky has done a lot of buzz around the blogsphere because people found it too polemical. Selling a whisky, and for a good big bill, without explaining anything at all. I have to say that the £100 pricetag is quite step, but anyway I bought one. My view on this is that Glenlivet must have bottled something fantastic here to dare selling it with no information because if in the end the whisky isn’t so good all the PR Campaign will backfire on them…still £100…. Nose (91): more than average. honey, citrus, orange, fruits, mango, vanilla, spices, cinnamon, smoke. Palate (91): powerful, oily. honey, spices, cinnamon, wood, liquorice, citrus, nuts. Finish (91): longer than average. honey, spices, cinnamon, wood. So based on other whiskies I have already tasted I rate this The Glenlivet Alpha with 91 points over 100. It has been a great tasting. I have to say that I really haven’t enjoyed the three first Glenlivet as I should just because my mind was on the Alpha stuff. Anyway, it has been a real pleasure to retaste 12 years old and discover the magnifique Glenlivet 18 years old, a good old whisky with still a decent price. So what I think of Alpha? Well, I bought a bottle much as a bet that they have bottled something awesome here and I think they have really done it… still £100 for a 15-17 years old ( my guess! ) whisky bottled at 50% ABV is a big step but if it works for Highland Park, Macallan or Bruichladdich why not for the Glenlivet. What do you think of all this premiumnisation of whisky and their limited releases? Have you bought any of late?